Add whatever fruit or nuts (or chocolate chips?) you like to this tasty whole-grain muffin. 22 mins. to 30 mins. Preheat the oven to 425°F. 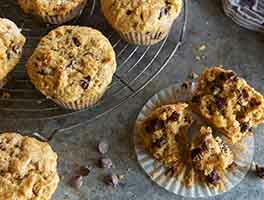 Lightly grease a 12-cup muffin pan; or line it with papers, greasing the papers. Whisk together the flour, oats (or Hi-maize Fiber), sugar, salt, baking powder, cinnamon, and additions of your choice: dried fruit, nuts, and/or chips. In a separate bowl, whisk together the milk, vanilla, butter or oil, and eggs. Pour the wet ingredients into the dry, and mix until just blended. Scoop the batter into the prepared pan, filling each cup three-quarters full. Sprinkle tops of muffins with coarse sparkling sugar, if desired. Bake the muffins for 15 to 18 minutes, till they're set and a light golden brown. 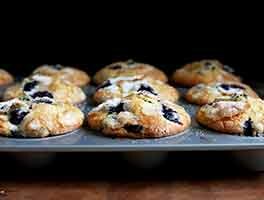 Remove the muffins from the oven, and let rest in the pan for 5 minutes before turning out to cool completely on a rack. Serve warm. I used 1 1/3 cups of equal raisins and walnuts along with the vanilla and cinnamon. I'm not sure if the oats I used were quick oats. They came out gummy and a bit bland. I love King Arthur Flour just not this recipe for me. 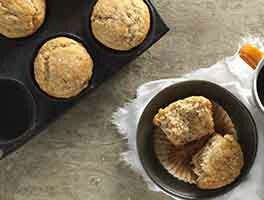 I recommend this recipe based on the fact that it is simple, the muffins raised really well & the ingredients are common things you'd have on hand. But I was surprised to find the muffins are kind of bland tasting like some reviews said. I didn't use dried fruit, but added 1/2 t. of espresso powder & chocolate chips. Maybe the fruit adds flavor? I added the vanilla & used vegetable oil instead of melted butter. I'll give the recipe another try with fruit & maybe try butter/oil half & half. I think some oil might keep them moist. So versatile! I sub some of the milk for OJ, and let it rest at least 30 minutes (even all night) and the longer it rests, the fluffier they are! I've used all manner of dried fruit and nuts, even orange/cardamom/cinnamon. I had a question, though - I recently made some spiced molasses cookies from one of my cookbooks, and I thought wow, these flavors would be amazing in those muffins! Obviously I could just use the spices (ginger, cinnamon, cloves, and allspice) but it wouldn't be quite the same without the molasses. I know that adding it would change the consistency of the batter. Do you think there could be some way to sub molasses for some of the sugar and/or liquid ingredients to add a bit of the flavor, or nah? 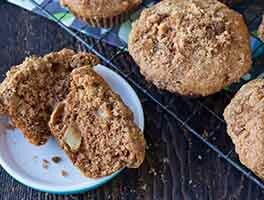 I made this recipe with 1/2 cup dried apple chips and 1/2 cup of KAF cinnamon bits. I also mixed hard white sugar with some cinnamon to sprinkle on top. Worked great! I tried this recipe recently and liked it. I have used several King Arthur flour recipes and always find them to be good. I especially am interested in whole wheat recipes as it helps my blood sugar. I am diabetic. I would especially like to thank KA for figuring the carbs in this recipe and posting it. I used a combination of walnuts and craisins. 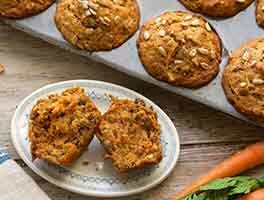 A delightful breakfast muffin or snack. I love the simplicity and versatility of this recipe. I made these vegan by using soymilk, melted Earth Balance margarine and flax seed slurry to replace the 3 eggs (3 tbsp ground flax seeds + 9 tbsp water). I also used old fashioned rolled oats as that's all I had on hand. My add-ins were chopped apple, sliced almonds and a teaspoon of ground cardamom. These muffins rose beautifully and are very filling. I think they would be great to take along on a camping trip. I love that these are 100% whole grain. I've been doing my own variations on this basic recipe for years and years now and it's about time to give it five stars for changing my baking life! This recipe is a gateway to experimentation. I make them with white whole wheat flour to have for breakfast before work, always try to use buttermilk instead of milk, and have found that two eggs is enough when adding lots of wet add-ins (as I do). Two favorite variations. Pumpkin (mix a cup of canned pumpkin in with the buttermilk) with spices, and scant half cup each of dried tart cherries, pecans, and chocolate chips. Another fave is apples, add 1-2 peeled and chopped, spices, and half cup of chopped walnuts. 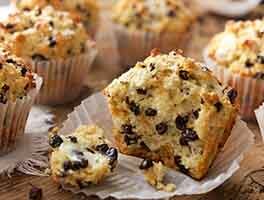 I loved these muffins and used dried cranberries and they were delicious to me. Substituted carnation milk and water for milk. Will make again and use other dried nuts for fruits. Healthy for sure.